The number of people testing positive for drugs on the job is at its highest rate in more than a decade. 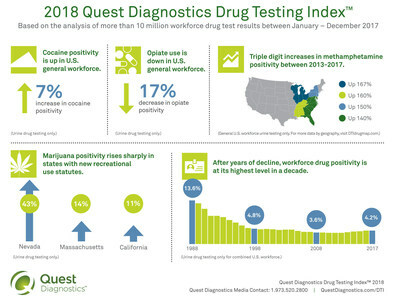 Driven by increases in cocaine, methamphetamine and marijuana, drug use by the American workforce remains at its highest rate in more than a decade, according to a new analysis released today by Quest Diagnostics (NYSE: DGX), the world's leading provider of diagnostic information services. The findings were unveiled at the Federal Transit Administration (FTA) Drug and Alcohol Program National Conference in Ft. Lauderdale, Florida. 2018 marks thirty consecutive years of the Quest Diagnostics Drug Testing Index™ (DTI), an analysis of national workplace drug positivity trends based on the company's de-identified laboratory data. The DTI has revealed insights into drug use in the United States since the Drug-Free Workplace Act was signed into law in 1988. In 1988, the DTI analysis found that the overall drug positivity rate among American workers was 13.6 percent. A new pattern emerged in this year's analysis, with cocaine positivity in urine testing increasing significantly in certain states among the general U.S. workforce. Double-digit year-over-year increases in at least four of the five past years were seen in the states of Nebraska (91% increase between 2016 and 2017), Idaho (88% increase), Washington (31%), Nevada(25%), Maryland (22% increase), and Wisconsin (13%). Increases in positivity rates for marijuana in the general U.S. workforce were most striking in states that have enacted recreational use statues since 2016. Those states include: Nevada (43%), Massachusetts (14%) and California (11%). These three states also saw significant increases in marijuana positivity in federally-mandated, safety-sensitive workers: Nevada(39%), California (20%), and Massachusetts (11%). Federally-mandated, safety-sensitive workers include pilots, rail, bus and truck drivers, and workers in nuclear power plants, for whom routine drug testing is required by the DOT.